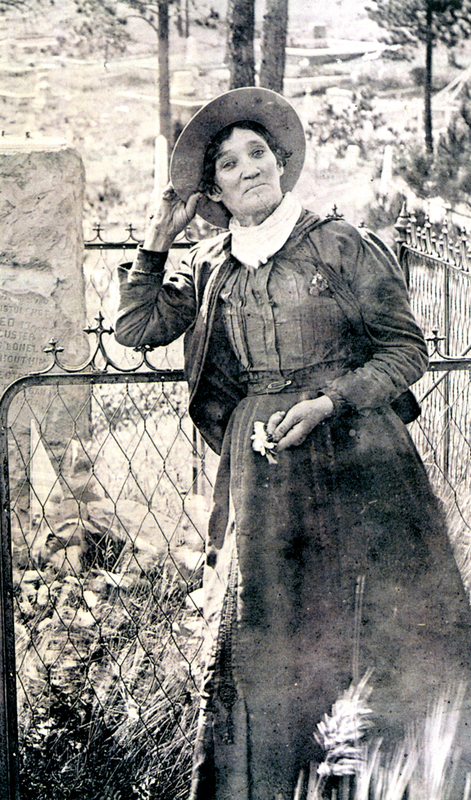 Calamity Jane mugs for the camera in front of Wild Bill's grave. "I've never seen this photo so close up. I LOVE that she has a safety pin holding her bodice closed, the silk bodice is shattered in places and it appears she is wearing long underwear under it. Probably cut the sleeves away, so she could wear the little jacket over it. I'm sure the kerchief around her neck is because the collar to the bodice is eaten away or just plain missing. Skirt appears to be heavy wool. Her 'fancy costume' must have traveled with her for a loooong time. What a great photo." "Imagine what you could accomplish if you knew you couldn't fail." Wow! Fantastic eye! Thanks for pointing those things out. Now I see them. Fantastic. Shows the wear & tear on a "beloved" outfit, which is probably her only Good outfit. I don't have a problem with your analysis of her clothes, only that put it into context with what her life was like. Calamity Jane had a problem with alcohol all her adult life, but by this time of her life--late middle age--it was badly out of control. Looking at her face and her eyes, I'd say she was far from sober when the picture was taken. Jane lived at the edge of or deeply in poverty most of her life, taking on "men's work" such as scouting and mule driving where she could get it. Look how work-worn her hands are and how leathery her skin is from years of living outdoors in all kinds of conditions. The "shattered" bodice may very well be someone else's cast-off. Wearing long underwear was standard for the 19th century, when the climate was colder and the weather unpredictable. The neckerchief and hat are marks of her various trades. I'm almost a little surprised she's not carrying a weapon.